In paperback for the first time, the much-beloved satirical novel The New York Times praised as "both a treatise and a romp"
Baby Ralph has ways to pass the time in his crib—but they don't include staring at a mobile. Aided by his mother, he reads voraciously: "All of Swift, all of Sterne, Invisible Man, Baldwin, Joyce, Balzac, Auden, Roethke," along with a generous helping of philosophy, semiotics, and trashy thrillers. He's also fond of writing poems and stories (in crayon). But Ralph has limits. He's mute by choice and can't drive, so in his own estimation he's not a genius. Unfortunately for him, everyone else disagrees. His psychiatrist kidnaps him for testing, and once his brilliance is quantified (IQ: 475), a Pentagon officer also abducts him. Diabolically funny and lacerating in its critique of poststructuralism, Glyph has the feverish plot of a thriller and the philosophical depth of a text by Roland Barthes. If anyone can map the wilds of literary theory, it's Ralph, one of Percival Everett's most enduring creations. 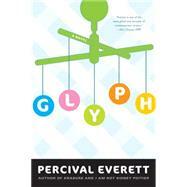 Percival Everett is the author of more than twenty books. He is the recipient of the Hurston/Wright Legacy Award and the PEN Center USA Award for Fiction. He teaches at the University of Southern California and lives outside Los Angeles.